I have talked before about the “Lucky Lady” lobster boat coming back to life in the Foggs boa shop. It’s an amazing and beautiful vessel. I absolutely LOVE going to see her sitting regal on her stands, taking up just about the entire width of the boat shop with her beam stretching across the room. Her red hull just stands out so beautifully. It really is like a thoroughbred horse getting a scrub & polish to live out his life leisurely with someone who loves him so much they would do anything for him. This boat, this “Lucky Lady” had a quiet start in life. Lyford Stanley designed the vessel. He was the main designer for the John Williams Boat Company. This beauty was built in 1974. In 1973 Jacque Williams & Lyford Williams decided to produce the first fiberglass versions of the Stanley 36′ design. They started building the mold, which by the way is quite a process. It takes about as long to build a mold as it does to build the hull of a boat. I always thought of the molds for boats as jello molds. It’s about the same process, just WAY different materials being used! You have the mold, you spray in the “Pam” or spread the mold release wax, then in short….make your ‘jello”. NOW….don’t get me wrong, I really did skip a BUNCH of steps, mostly because I don’t want to bore you to death & I don’t really know them all! ANYWAY, the Lucky Lady is possibly the first boat to come out of the mold, according to the owner. The boat even still bears the visible plank lines from it’s wooden predecessor! Since then there have been over 100 Stanley 36’ s built from that mold. The Lucky Lady has worked as a lobster boat since it was build, most recently out of East Boothbay Harbor, Maine. She is well deserving of this spit shine and polish. She is getting a rest and will be very spoiled in her “retirement.” She is getting so many detail touches to her, like her color scheme of burgundy & cream, so classy! She will definitely be the envy of the other working boats and something for other working boats to look forward to as they contiue to work through their day! The most interesting thing about her refurbishing is that her owner wants to keep her looking like a true working lobster boat! Which after all, she is a true lobster boat. She has seen more things in her life at sea than most of us will ever know. Her hull has stories we all wish we could hear her tell us. 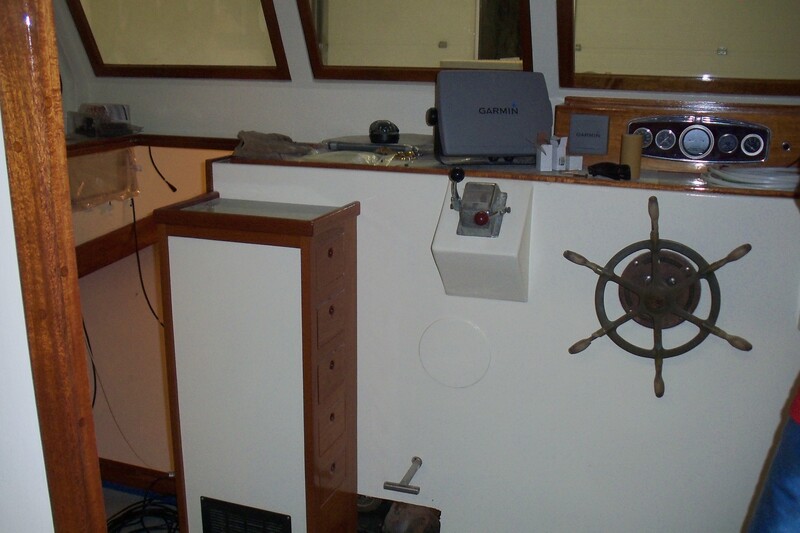 Her wheelhouse is a beautiful and stunning combination of new & old with the new cabinetry and stunning mahaghony doors and original tarnished captain’s wheel. The back of the boat which used to carry lobster pots, bait & hardworking lobstermen/women now will hold deck chairs and sunscreen, maybe even a fishing pole or two. Come back and check this out for more news on the Lucky Lady! She will return to her home in the water in the next week or so and I will be “lucky” enough to be there camera in hand!! I will surely bring you all the details and the videos and pictures!